A while ago, I visited a local antique shop, entered a giveaway while I was waiting in line, and won! I am always happy to win a gift card to a place that I will be happy to spend the money. We knew that we wanted to spend the gift card on another insect to add to our 40+ specimen collection. 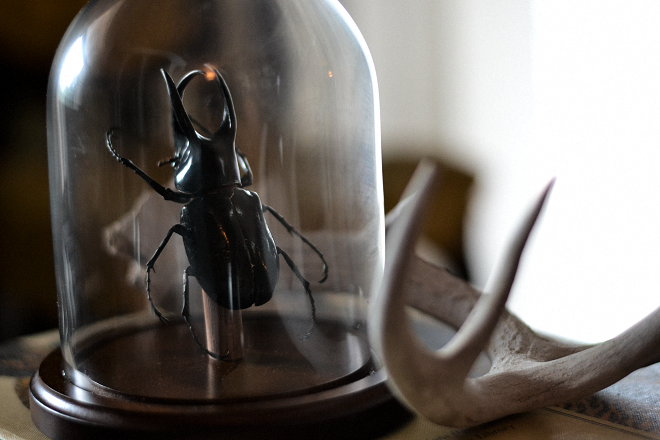 The beetles are my favorite, but we already have a wonderful atlas beetle with it's wings out from our favorite taxidermy shop, Deyrolle in Paris, France. Part of his charm is that he was a steal (discounted in the "damaged" section because his wing was slightly torn), wasn't technically legal to bring into the USA, and he was one of the first insects that sparked my love of entomology. I was thinking we would get another insect that we don't have yet. We have a variety of butterflies, an atlas moth (the largest moth in the world), luna moths, a couple of local beetles, a local lubber, a walking stick, and more, all mounted in frames. 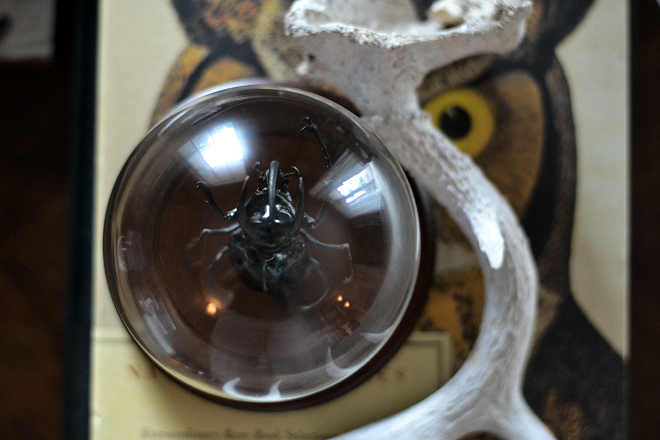 We didn't expect to purchase a beetle that we already have, except that this beetle was suspended in a cloche, a bell jar, and not in a frame. It might sound kind of crazy, but in a cloche this atlas beetle seems more pet-like, and we can view him from every angle to study him. He's a fantastic asset to the natural world and I get so proud when I see them preserved forever. The world should always be able to admire these incredible creatures and to learn from them. 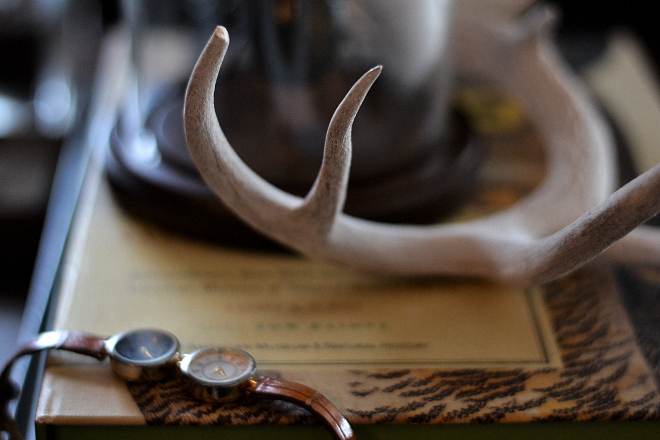 It's no secret that I'm an admirer of all things natural, and while it might seems strange that an ex-vegetarian would keep deer antlers and taxidermy insects in her house, I feel so grounded being surrounded by nature and science. 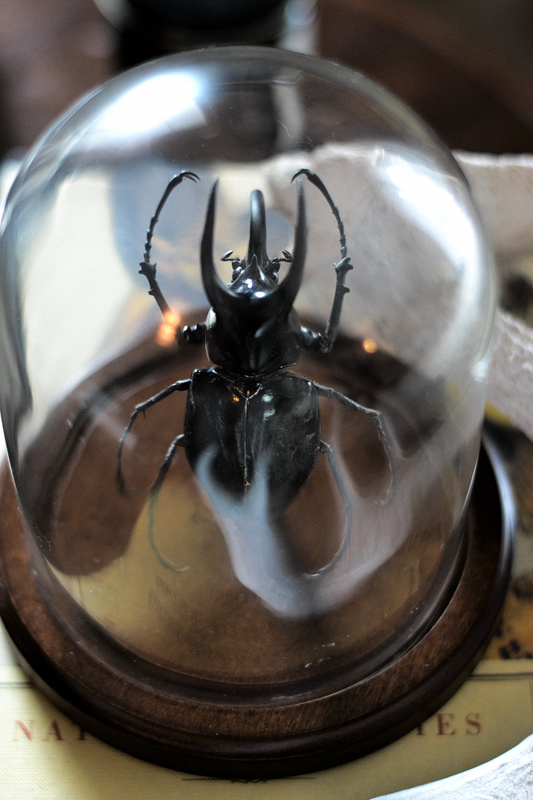 One day, I'd like to adopt a beetle and keep him as a pet instead of as a wonderful piece of science. But I still have so much to learn about beetles before I adopt one to live in my house instead of nature. i was also a vegetarian for about 18 years and it actually doesn't sound strange to me at all. i love that you appreciate all kind of creatures and find the beauty in them. everyone should be able to look deeper, or differently, as you do to truly see the wonder in everything. My first question (before you answered it) was how on earth did you get that beetle back into the states from Deyrolle?? Genius girl, I tell you. Semi-related, I've been searching for the perfect vintage green-blue paint that matches the wall color at Deyrolle and have yet to find a match. Any suggestions? I figure if anyone would know, it would be you. LOVE!! Love, love looooove. I'm so fascinated with dead things from nature. My collection is pretty slim and mostly contains antlers and bones, but I'd love to start adding more dead creatures...a bat in a shadow box would be my DREAM to have. And I love the bell jar! Does he have a name? You seem to be winning a lot of things lately haha, first a necklace now this ;) I love that you're into this, too! It's so unique and totally awesome. The bell jar container is really pretty! That is absolutely stunning. You done good!